The Sage Motel, Sioux Campground, and Corral Horse Motel are located in Harrison, Nebraska next to the historic highway 20…the longest continuous highway in the United States. Harrison is 10 miles east of the Wyoming border and — miles south of the South Dakota border. The Sage Motel was originally horse barns at the nearby Fort Robinson Army Post. The barns were moved 26 miles to their current location and converted into a motel in the 1960’s after Ft Robinson was closed after WWII. Sioux County originally covered 1/5th of the State of Nebraska. Its size now is 2,067 square miles and the 2010 population of 1,311. The Village of Harrison…called “Nebraska’s Top Town” because of the altitude of 4,678′. 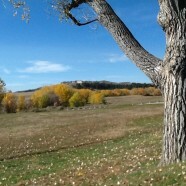 Sioux County consists mainly of large cattle ranches and farms. Harrison is on the almost 200 mile long Buttes to Bridges Byway. Today you can experience these diverse landscapes along sections of the Cowboy Trail and experience the sites, solitude and vastness that early travelers and settlers felt as they first saw this region.